There’s a certain seriousness in these parts as to just what constitutes a classic fish taco. Fried vs. grilled fish? Red cabbage vs. green? Whatever the details, there are 4 basic parts: the fish, slaw (in the recipe below a close cousin, cucumber relish, is used), pico de gallo and crema or sour cream. Purists insist that pico de gallo be used in fish tacos, as it is typically has less liquid than its salsa sister. Making a paste of the garlic and salt takes off some of the raw garlic’s edge and blends more easily into the other flavors. For the marinade: Mix all of the ingredients together in a shallow dish. Thirty minutes before grilling, toss the fish with the marinade and allow to marinate in the refrigerator. For the cucumber citrus relish: Sprinkle the cucumbers and red onion with 1 tablespoon of salt and place in colander to drain excess water for thirty minutes. Just before serving, combine the rest of the relish ingredients and adjust the seasoning with the remaining 1/2 teaspoon of salt and pepper. For the pico de gallo: Place the minced garlic on a cutting board and sprinkle the salt over garlic. Using the flat part of a chef’s knife, comb the salt through garlic to make a paste. Just before serving, mix the rest of the ingredients together in a medium bowl and refrigerate until needed. For the crema: Mix together all of the ingredients and refrigerate until needed. For the fish: Brush the grill grate with oil. Heat the grill to medium-high heat. Grill fish with a bit of marinade clinging until just opaque in center, 3 to 5 minutes per side. Warm the corn tortillas on grill for about 20 seconds per side and then place in aluminum foil. Keep tortillas warm off the direct heat on the grill. For each tortilla: Spoon about 2 heaping tablespoons of the cucumber relish along the center of each tortilla. 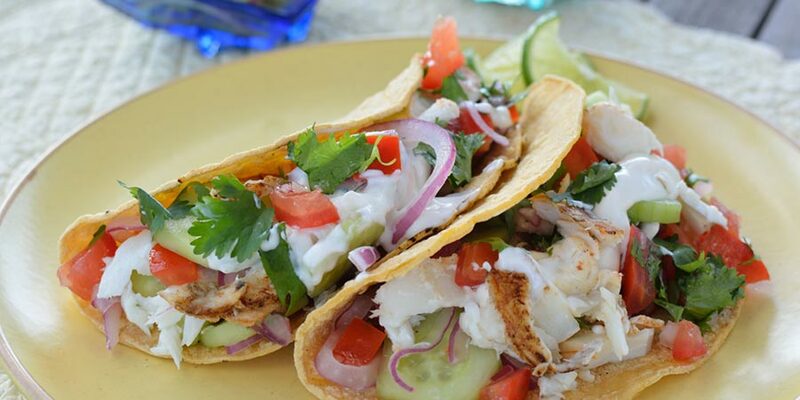 Divide each 4-ounce piece of fish in half and flake each half onto a tortilla. Spoon about 2 heaping tablespoons of pico de gallo on top of the fish. Drizzle each taco with about 2 teaspoons of the crema. Fold tortillas in half and serve. 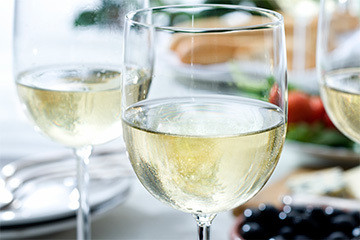 A ripe sauvignon blanc full of citrus flavors and perhaps a hint of tender herbs is the Napa Valley “beer” of choice for this summertime snack.